Giant scale RCAirplane-Kits are for pilots who enjoy the thrill of flying large rc airplanes. 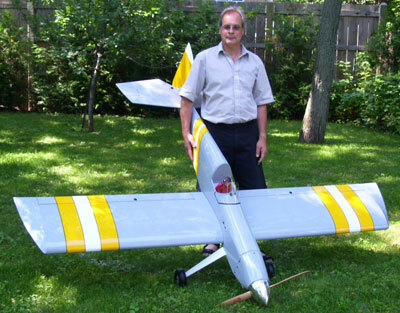 Many pilots find large scale radio control airplanes a delight to fly. However their are some concerns you should consider before making such an investment. - Are larger aircraft more expensive? - Are larger aircraft easier to transport? - Do you need a larger engine? - Do you have the time or EXPERIENCE to build a large scale airplane? - Do you have somewhere to store your aircraft when it is built? 1. Are larger Aircraft more expensive? - Yes larger aircraft are a GREAT deal more expensive, than regular size models. Some scale models range - $1500 or more. 2. Are larger aircraft easier to transport? - Yes they can be if your vehicle has plenty of room, if not you will need to make transportation provisions. 3. Do you need a larger engine? - Yes! you will need a very large possibly a gas engine. 4. Do you have the time or experience to build a large scale airplane? - This is very important, extra TIME and SKILL will be necessary to take on such a task. If you never built a large model, please visit the website at the bottom of this page for more details. 5. Where will you store your model when it is completed? - Large aircraft need a great deal of room for proper storage. These larger radio control scale aircraft are fun to fly. If you have a favorable answer to the above questions, then there is a website that accepts orders for scale airplanes. This is called the Eclipse50-01. They are called Aircraft Modelers Research. They specialize in radio control scale airplane kits. Aircraft modelers aim is to produce scale models that really look and feel like full scale aircraft. They have a very nice selection of models.